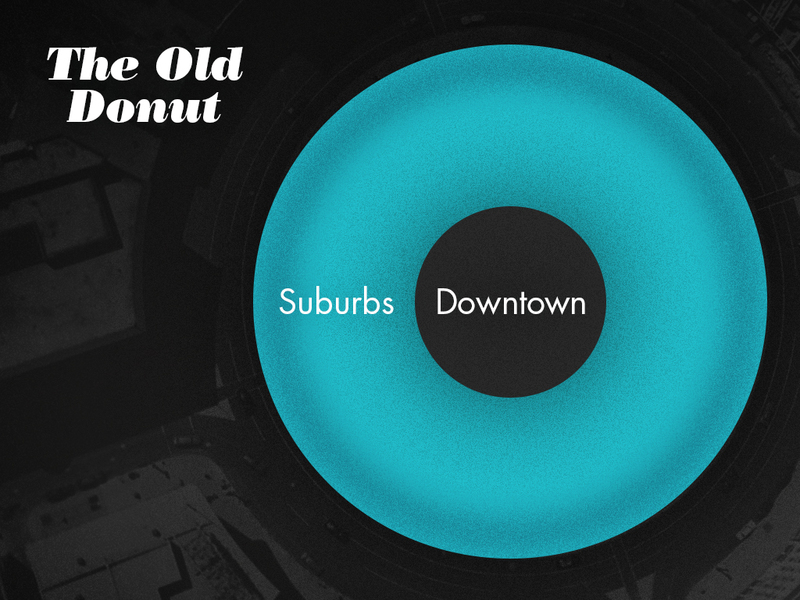 A few weeks ago on Urbanophile Aaron Renn discussed a historical concept of urban development known as the "donut" model. This concept takes place when a city's outlaying areas see more development than a city's urban core. This has historically been the development trend in many cities, including many rust belt cities like Detroit, Cleveland, Chicago, Saint Louis and Minneapolis, as well as some southern cities like Atlanta, and even here in Houston. European cities haven't been exempt to this pattern either. Mmm, donuts. In Houston, when you discuss donuts, the topic rapidly shifts to Shipley's. It's Shipley's versus the rest of the world here, although Dunkin Donuts is making a push for a Houston presence. I'm not really sure how fried breakfast foods ended up being an analogy for discussing urban development, but they're both things I enjoy, so I don't mind it at all. And, since it's now fall, all this talk about donuts brings back the memories of Blakes Cider Mill in Armada, Michigan, sitting in the middle of an apple orchard, chowing down on freshly fried donuts washed down by fresh-pressed apple cider. While I love donuts, I like bagels too. Houston's development, and the downtown development in many cities, is more like the experience of having a cinnamon crunch bagel at Panera, which one can argue is much like a donut anyways. You know the bagel has a hole in it somewhere. It's just filled in with sweet, cinnamon-y toasted sugar. You know the hole is there in the middle of the doughy periphery, it's just filled in. Maybe that toasted cinnamon sugar filling is the gigantic amount of sweet public funding that cities have dedicated to building these stadiums, convention centers, and even residential developments. It's not at all that these attempts are wrong, but we've just invested a lot of taxpayer money in them. More to follow on residential development, specifically here in Houston, in the coming week or so. Okay, back to cities now. 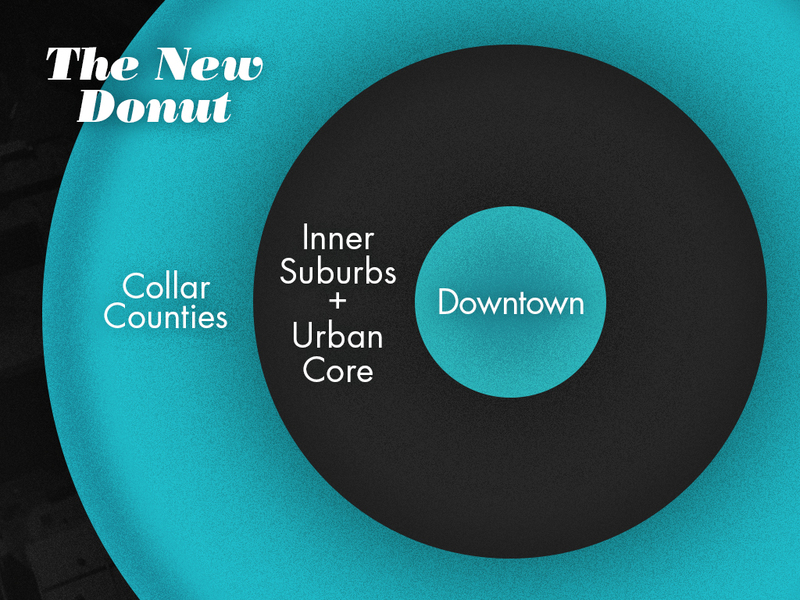 This "new donut" paradigm is precisely what has happened recently in Houston. The Astrodome was replaced with Minute Maid Park. It's only fitting that in a discussion about cities and breakfast foods, that we have a stadium named for a brand of orange juice. There's not much that we can thank former Enron Chairman Kenneth Lay for, other than his insistence that the Astros establish a downtown field, ultimately incorporating the former Union Station into the stadium's design. The Rockets then moved from The Summit to the Toyota Center, the George R Brown Convention Center was built, along with many hotels, parks and offices. One response to this phenomenon, and to the pressures placed on in-demand city neighborhoods undergoing gentrification, is zoning reform that would eliminate exclusionary zoning practices by municipalities. Many urbanists and economists, and a growing number of other social scientists, say that the elimination of exclusionary zoning policies would generate a greater supply of housing, reduce housing costs and reduce the kind of wealth and social inequality that plagues our nation. My thinking on this is ripe for academic study and scrutiny. I hope at some point someone picks this idea up and tests its veracity. In the meantime, the best way for me to explain my reasoning is through a thought experiment. The real problems causing the affordability crisis are regulations that prevent increases in the supply of homes. Eliminating restrictive zoning regulations will give consumers more choice and make housing more affordable. For those who truly care about making housing more affordable, price controls are not the answer. There's more. The argument is that zoning restriction "continues to constrain, the supply of low-income housing." Others tend to agree. But do their claims really hold up in Houston? In some areas it may, but it still remains true that few would want to live in a neighborhood that is unsafe or lacks good schools or public services. I'd like to throw Houston in the running to test some of these claims surrounding zoning reform. Before anyone claims that eliminating zoning will help alleviate a need for housing supply or segregation, we've got to look at a control, much like in a scientific experiment. The only problem is, neighborhoods don't operative in a vacuum, so scientific principles can't be used here. Zoning reformers claim that eliminating zoning in cities would do three things: 1) increase housing supply, 2) decrease housing costs, and 3) reduce the wealth and social inequality that is so prevalent in our country. Regarding Houston, I think we can falsify all these claims. Our city has been and continues to be a very segregated city. Take a look for yourself at the geography of Houston's low income population, especially toggling between 1980 and 2010. It doesn't look like much has changed. Or, take a look at our census data mapped out. At first blush, it doesn't look like an absence of zoning can simply fix housing ills. The problem isn’t sprawl. It’s the reasons for the sprawl. In Houston, a city where civic boosters regularly tear their rotator cuffs slapping themselves on the back in congratulations for Our Rich Diversity and Amazing Quality of Life, sprawl is driven not by the search for new opportunities, but by the conviction that Our Rich Diversity and our Amazing Quality of Life are mutually incompatible. People will decry how affordable housing is here in Houston. Please visit and see for yourself just how expensive housing actually is, at least within a 5 mile radius of downtown Houston. Sure, housing is still affordable in Houston in general, just not in many of the traditional neighborhoods where one may first want to live. It's now become a reality that middle income families and workers are not able to find affordable housing. Houston's housing is getting more expensive, and it's forcing families to move to outlaying areas, while higher income families and individuals are moving into the city's core. Take a look at this map showing the median sale price of homes within the Houston area. It's certainly darker in the middle, with Houston's highest prices in the Heights, Montrose, River Oaks and Memorial areas. In addressing housing supply, Houston's ordinances already allow for garage apartments or duplexes on single family lots, but since many subdivisions rely on private deed restrictions, some choose to prohibit anything other than traditional single family residences. Zoning reformers must think that private land use agreements would be lost on those in unzoned areas. And, the perception that there is a grand supply of housing in Houston is not necessarily true either. Houston has a 3-month housing supply, compared to a 5.5 month supply nationally. We simply are able to build more housing in the region due to our ordinances (or lack thereof), as well as our geography. As with most sun belt cities, the Houston metro area has almost no natural or political boundaries that would stunt our growth and sprawl. Sure, we can build new housing, it's just getting further and further away from activity centers. This leads us back to the "donut" and "new donut" paradigm illustrations. Houston's inner core, at least that area within the I-610 loop, predominantly west of I-45, makes up most of the "new donut" downtown area, even though Houston's currently gentrifying and historically vibrant neighborhoods lie just outside of its downtown district. Our "Inner Suburbs and Inner Core" portion of Houston (think Alief, Sharpstown, Southwest and Southeast Houston, Northside, Acres Homes) is continuing to age, and is evidenced when we look at home sale prices. Naturally, then the newer homes in the "Collar Counties" (think Sugarland, Cinco Ranch, The Woodlands, Kingwood) attract families and professionals looking for new housing. That comprises Houston's "new donut" paradigm. So, does the "donut" analogy hold true in Houston? More or less, I would say so. At the very least, we are in the late transition stages of moving into the "new donut" paradigm. And we can testify that a lack of zoning does not mean that housing supplies will rise, housing costs will decrease, that there will be enough of a diversity of housing, or that societal inequalities will be remedied. If a reformed approach to zoning is to be a fix for responding to the challenges of the Inner Suburbs and Urban Core periphery, then don't look to Houston. Our lack of zoning certainly hasn't fulfilled the housing predictions of zoning reformers. I hope that at the end of the experiment, Houston is not the precipitate. If you wanted to take this breakfast thing even further, some might say that the Houston area's development is concentrated in more of a wedge, or scone if you will. (For the record, scones are definitely the Rodney Dangerfield of the breakfast pastries. They are far less respected than they should be.) This wedge or scone analogy might be a better fit when looking simply at the city of Houston proper instead of the larger Houston metropolitan area, and would comprise of the area from downtown Houston, including Montrose, the Heights, River Oaks, Memorial, and extending into Harris and Fort Bend Counties to Cinco Ranch area, and out to Katy. Now if we could just find a city that had very small nooks and crannies of disinvestment among a spread of development, we might have ourselves an "English muffin"-type paradigm. Okay, that's a bit too far. After all, it's breakfast, and I'm hungry. I'm going to grab a donut. Or bagel. Or scone. Or English muffin. And, maybe I'll just wash it all down with a Minute Maid.